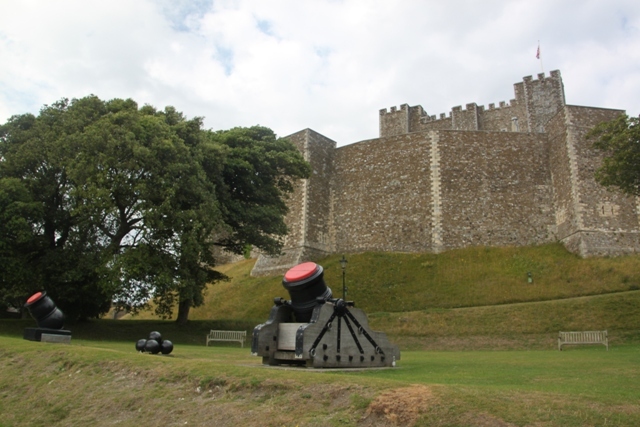 Dover Castle is not just about the tunnels and war history. 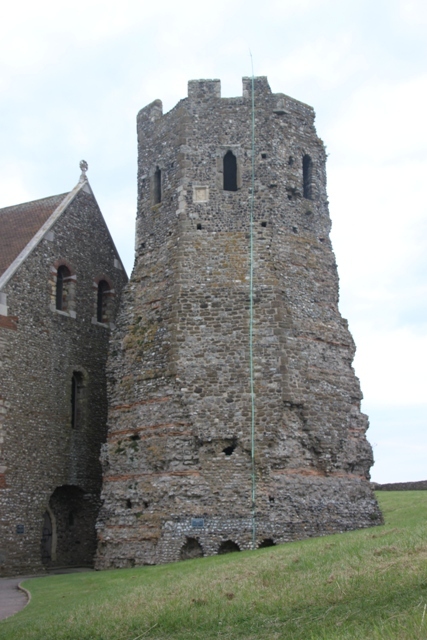 Built in the 12th century the strategically placed fortress has kept an eye on the narrowest stretches of the English Channel for a very long time and has a wealth of fascinating history. We spent the morning in the tunnels immersed in war stories, the afternoon though was all about the Plantagenets. The Great Tower and Keep were top of our afternoon list. As we walked through the impressive drawbridge Son was more than thrilled to discover a whole raft of children’s activities going on. He arrived just in time to be “recruited” for King Henry’s army and set to this job with gusto. 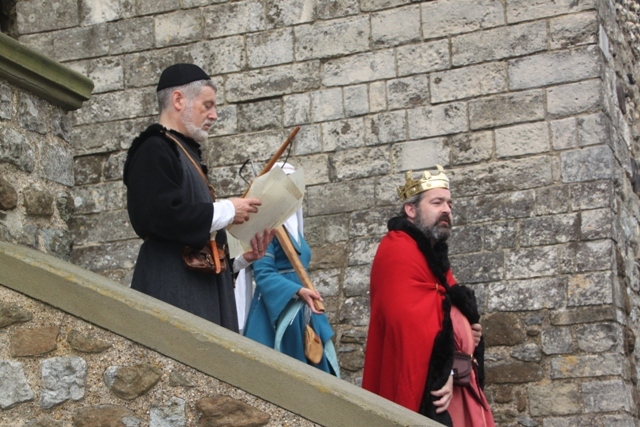 The king arrived, told the “soldiers” about the army and what he expected, then this crowd of warriors was led through the kitchens and other rooms in the Great Tower by costumed guides, parents trailing a distance behind. 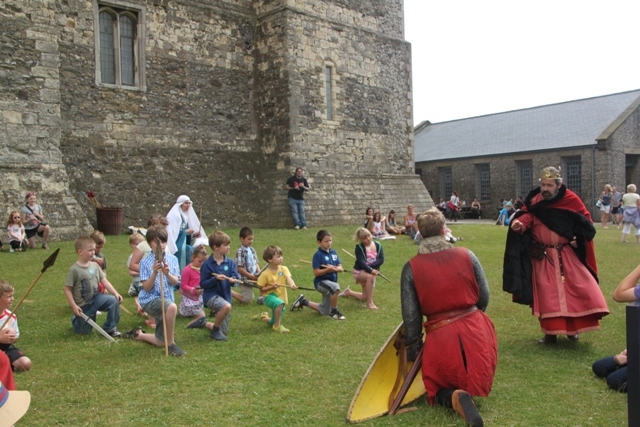 The children were told in a fun and interactive way about the life of a soldier, given “weapons” and then led outside on the grass to fight for the king. Entertaining, captivating and so well done, Son had a blast joining in, we found it all incredibly entertaining. Army training complete we wandered back through the Great Tower to look in a bit more detail. 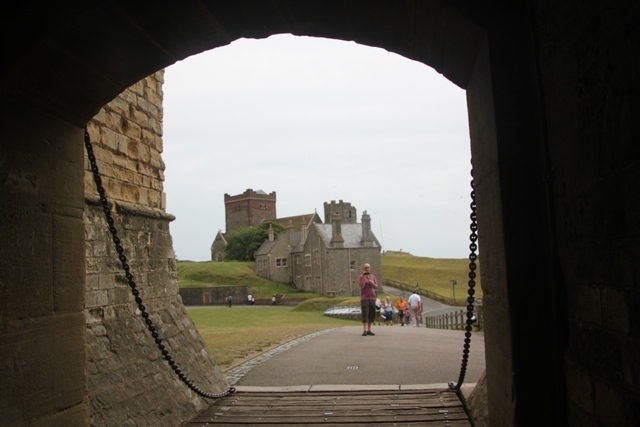 Three floors to explore, the ten metre thick walls are from the 12th century but everything else is a recreation. 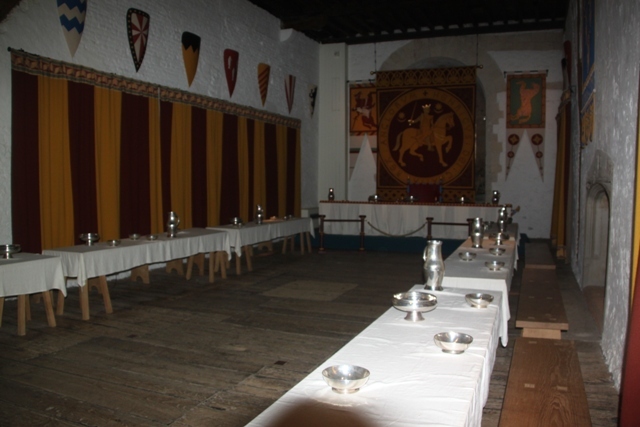 Superb attention to detail, the whole place has been transformed and furnished to look as it would have done in the days of Henry II. I found the bright colours surprising, apparently more expensive and thus more impressive, this was indeed a luxury castle. 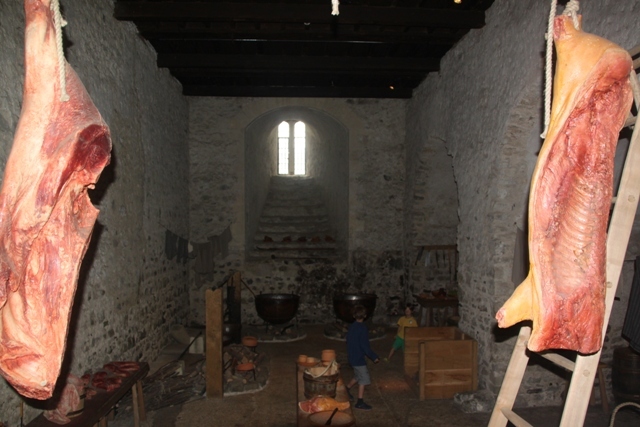 The King’s Hall and Privy Kitchens were my favourites – cuts of meat hanging from the ceiling and hands-on utensils in the kitchen were great fun. Costumed guides in all the rooms ready to chat as they went about their business added to the whole atmosphere. Son loved the experience and could have hung out here all day long. Nothing is off-limits for children, they can touch everything so a relaxed feeling prevails for parents. We wandered around the three floors and exited onto the roof for some great views. An exhibition next door about King Henry and his offspring was interesting, we also briefly looked in the Princess of Wales Regimental Museum. Fascinating too, this has information on that regiment with displays on battles fought and finishes up with their role in Afghanistan. We had some time in the grounds but with eighty acres to explore that almost requires a day out on its own. 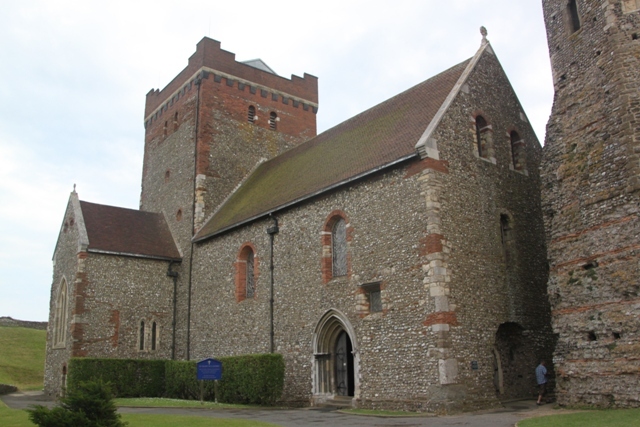 The Roman Lighthouse and church are worth a look, we walked around the battlements and explored some of the beautiful gardens. Leaving at closing time, we spent a very packed day at the castle. Unable to squeeze in everything here but impressed nonetheless at how much we did manage and especially at our fresh view into 12th century life. So much to see and do at this mightiest of fortresses, I think someday we’ll have to go back. It was for sure – a castle with some great stories. Looks great! 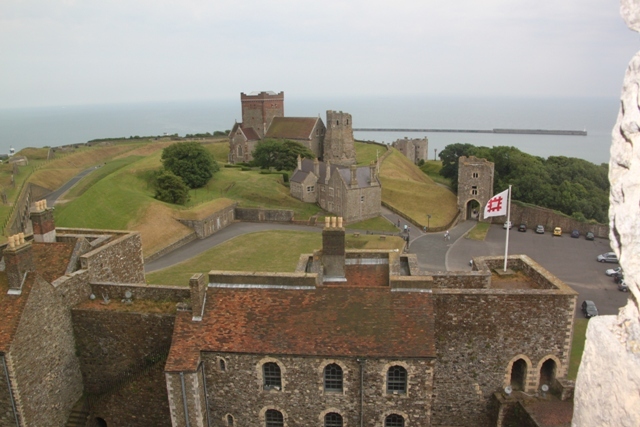 I visited Dover with my family very briefly on our last trip to England (about 5 years ago now!). I remember seeing the castle from a distance but we didn’t end up going in – I think we had arrived too late in the day, because we were only in Dover for a very short time. I think I’ll have to go back again some day! 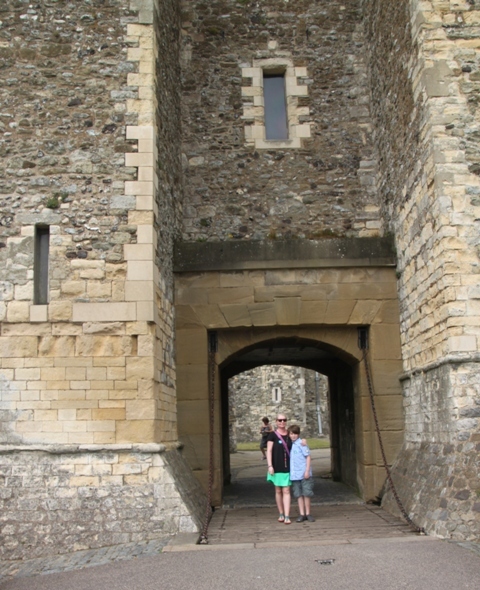 It’s definitely worth a visit if you ever find yourself in Dover again – so much to see and do, we struggled to fit everything in! I loved the castle!!! We just did not have such a “show” going! That was one of our highlights Erika – supposedly for the kids but the adults got just as much fun out of the whole thing!! We were the people who always passed through the port at Dover and never spent any time there–although we’d heard that the history of the tunnels is fascinating. I knew nothing about the castle–it sounds fabulous too. Okay, next time we stay a day instead of just passing through. Thanks for the tip and the history! We might have been those people too were it not for the time of our ferry and a long drive to get to Dover! Made sense to stop and take a look around – very glad we did!! The castle is wonderful, definitely worth a visit if you find yourselves back in that area again. This was so well done and everyone – adults and children alike enjoyed it so much Suzanne. 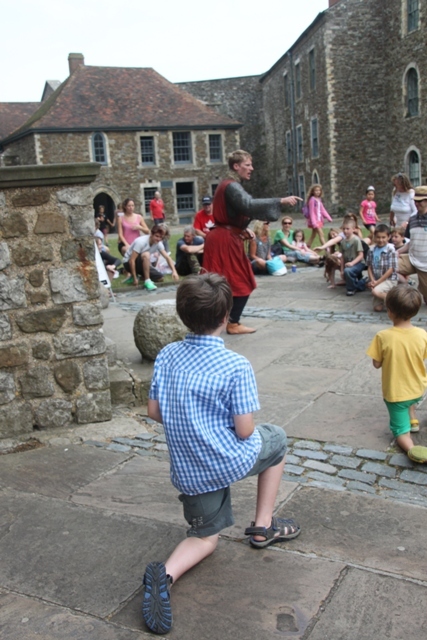 They have really improved the engagement factor at Dover Castle since I was there (decades ago) which is great to see. My kids always love all of those interactive performances about history and little activities to do throughout a site and it is great for Mr Pict and I as it means we can actually spend time exploring details while they have fun. This was such a lot of fun for everyone – like you say, engaging the children gives you the chance to actually look at things in a bit more detail. 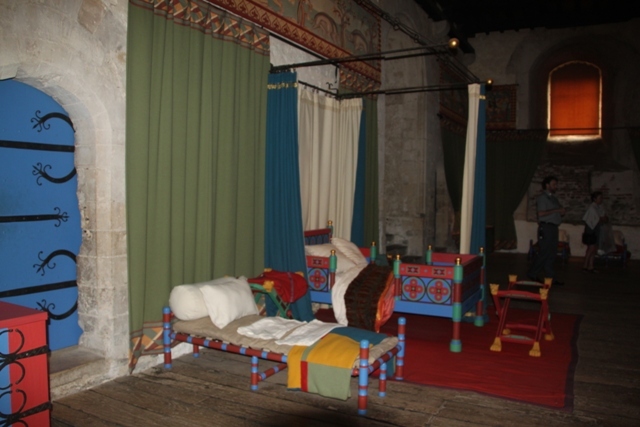 It was so well done here as well – and being English Heritage members all free for us. A superb day out. Those memberships are wonderful, aren’t they? We were always members of the National Trust for Scotland and Scottish Heritage (who have reciprocal arrangements with their English counterparts) and we always got more than our money’s worth out of them while also knowing we were contributing to preserving these great buildings. Definitely Laura, we get superb value for money as well plus often go to places we might not otherwise!! Have a great weekend. Very cool. It looks like a lot of fun for the kids too! It was – much laughter and fun but I think the adults enjoyed it all every bit as much as the kids and were itching to join in!! Beautiful blog post and pictures. I hope I’ll be able to see it some day! Thank you Shikha, it is a lovely place and stuffed to the brim with wonderful and fascinating history, a fantastic day out. THE “LOVE / HATE BLOGGER CHALLENGE”! 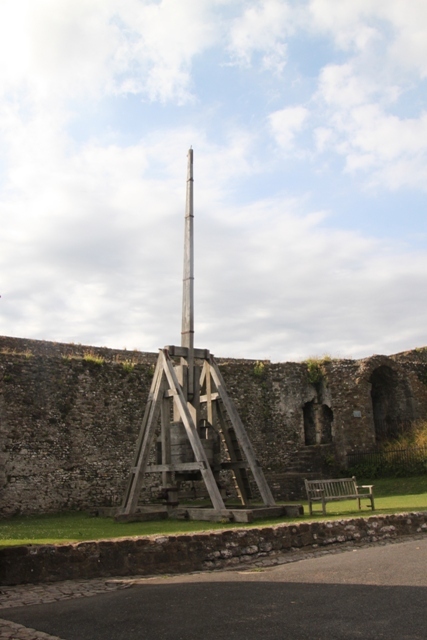 Don’t know about this one Melissa but we’ve seen them fire one at Warwick Castle in England before. Very cool – although the build up takes waaaay longer than the firing – blink and you miss it!! What a great post and pictures. So much history. It makes your mind swim with all the stories packed inside these walls. Nicely done. Have a great weekend, Joy. I felt exactly that way George – the stories those old stones could tell. Nice to see some of them re-enacted in such a fun way. Hope you gave a wonderful weekend too! It was luxurious but none of it is authentic, they’ve recreated it but in a great way and encourage children to be hands-on and go anywhere they please. That always makes life a bit easier and more chilled for frazzled parents worried about inquisitive fingers!! The whole castle is incredible, you would probably need more than a day, we barely got to peek at the Roman lighthouse before we had to leave. Definitely plan to revisit sometime!! It’s great that they are engaging children in history even if it is a modern reproduction in parts. Great for parents too it can be quite exhausting trying to keep them from touching things when you’re visiting museums!! Thanks for dropping by Susan and for commenting – your blog looks great! Thanks, Joy – I hope you’ll pop in now and again! I love how attractions like Dover really go all out and make the historical facts fun and interesting for the kids (and adults) who visit. That is brilliant your son got to join in all the fun. The castle inside looks so much to take in – the cuts of meat hanging is a really nice touch! I will definitely stop by here when we eventually get to visit! It’s so interesting for adults and loads of fun for kids. No worries about little hands touching things or climbing and clambering – in fact they encourage it. We had such a fun day out here and would definitely go back. We loved our visit — years ago — to the castle, too. I was amazed by the layers and layers of history there. That was exactly it – the layers of history from so many different fascinating times – we loved it too. Thanks so much for liking my post on Suitcases and Sandcastles. I’ve enjoyed taking a look around your lovely blog. 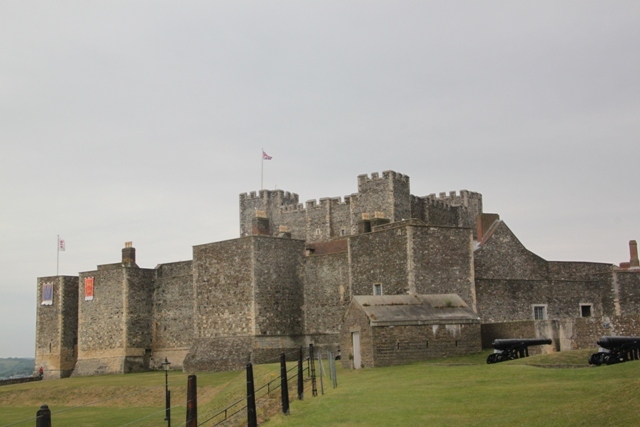 I love visiting Dover Castle. My two boys would really like to do the activities you’ve written about here. Thanks Clare for coming by here too! 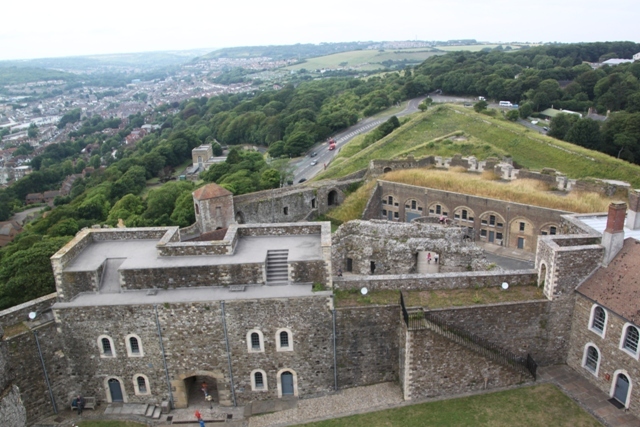 Highly recommend Dover Castle, we had such a great day out there, so much to see and do, am sure you would love it.